Explore the many city-centre places associated with the notorious ‘Squizzy’ Taylor: theft, assassination, bombing, hideouts, standover and more. 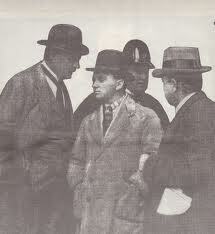 The diminutive ex-jockey was a self-promoting gangster, bootlegger, jury rigger, blackmailer, thief and on occasion, a killer. His notorious vendetta with the Fitzroy ‘push’ eventually resulted in his death in mysterious circumstances in 1927. Squizzy’s life has been highlighted by a new TV series and the brilliant novel ‘Runner’ by Robert Newton. Taylor was a product of the 1893 depression, life in Struggletown (Richmond) and the rise of the christian temperance movement which led to prohibition gave rise to lucrative criminal markets in sly grog, drugs, betting and brothels. Our walk is a voyage through the incredible era and architecture of Squizzy’s Melbourne (1888-1927): In his short forty years he witnessed the birth of planes, motor cars, electric lights, telephones, radio, talking pictures, vaccination programs, electric trams (1919), Federation (1901), the flu and polio epidemics, the women’s vote, VFL, World War One, the Roaring Twenties, the Labour Party, the Jazz Age, Art Deco, Prohibition, the 1893 depression and the 1923 police strike. SCHOOLS : See our popular Squizzy Taylor School Tours based on Runner by Robert Newton with group prices. Little Lonsdale Street: While Taylor was in Melbourne Gaol, his girlfriend Dolly Gray (she was 30, he was 19) supported herself by operating a venue from her house in Little Lonsdale Street, Melbourne. 189 Lonsdale Street In 1929, a former Squizzy gambling venue was blown up at number 189. 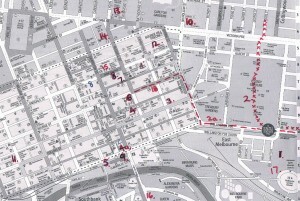 Cnr Exhibition and Bourke Street: Eastern Market A notorious location where the Gun Alley murder occurred in 1921 and where the mysterious Madam Ghurka told fortunes, analysed your head shape and sold clothes and cosmetics. Squizzy was rumoured to stand over traders at the market. (see p.103 The runner). Squizzy mug shot. What a charmer! 540 King Street, Melbourne. In June 1921 Taylor’s luck ran out when was caught red-handed one night in A W Scales Bond Store He was committed to stand trial for breaking and entering and released on bail of £600. However, when Taylor’s trial date arrived, he disappeared. For more than a year the police searched for Taylor without success. He was eventually acquitted as the jury ‘couldn’t make up its mind’. Little Collins Street In 1922 a violent confrontation between gang heavies Stokes and Slater ended in Slater’s admission to hospital with five bullet wounds and Stokes under arrest for attempted murder. Stokes claimed he shot Slater in self defence and when tried was found not guilty. 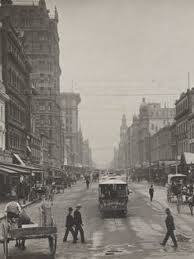 St Kilda Road In May 1924, in a hit and run, Squizzy ran down and killed Daphne Alcorn who was alighting from a tram. He lied about his whereabouts successfully. Melb Mag Court, Russell Street: In Feb 1924 charged with assisting the escape from Pentridge of Angus Murray. Squizzy centre with two fellow thugs. that someone from Richmond had tipped off the police and suspicions were raised further when Stokes, a member of the Richmond gang, gave evidence for the prosecution in exchange for the police withdrawing charges against him. The two men were found not guilty, but that was not the end of the matter. Outside court after the trial, angry words above were exchanged by the opposing factions and both Stokes and Taylor were struck by punches. Flinders Street: In 1921 posters for the arrest of Taylor and Pender were circulated to all police stations across Victoria. Pender was arrested by police in July 1922 after she was spotted window shopping in Flinders Street, Melbourne. Flinders Street: Hatters Shop, Flinders St Station: Bullet hole in window. Claims that Squizzy fired from Young and Jackson? 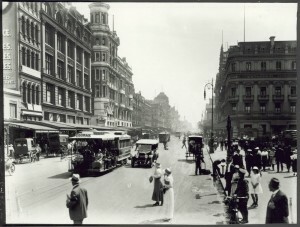 Flinders Street: Young and Jackson: Witness claims he was run over by horse and cab. Victoria Parade: Trades Hall, Victoria Street: Taylor accused of involvement in murder of a policeman due to a failed burglary. Probably innocent. 186 Bourke Street: Cnr Russell and Bourke: – In 1921 Joseph Lennox Cotter shot Squizzy in the leg in the crowded street as he was entering the Bookmakers Clerk Association. 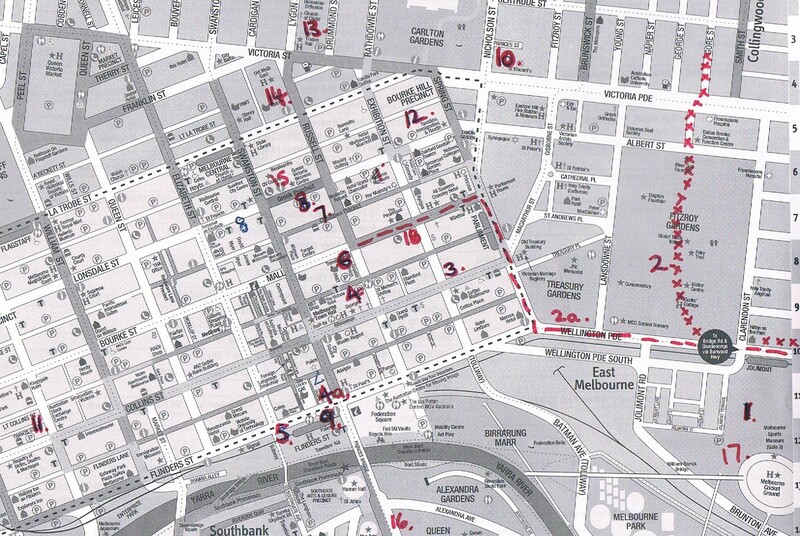 111 Bourke Street: The Eastern Market In 1921 Squizzy donated a reward re the Gun Alley murder that occurred there. The wrong man was hung. (See also p 103 The Runner). 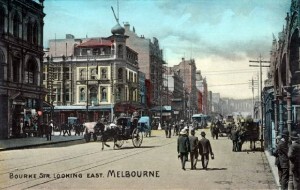 Palace Hotel, Royal Lane, Bourke Street, (Gaiety Theatre) where a hidden basement was discovered reported to be Squizzy’s hideaway. St Vincents Hospital: On 27 October 1927 an automatic pistol was found in Taylor’s pocket after he arrived at St Vincents hospital and two other pistols were discovered in the vicinity of Cutmore’s house, one was hidden in the cistern of a toilet in the backyard and the other was found in a right-of-way some distance away. Melbourne Hospital, Lonsdale Street: 15 Oct 1919. Three shooting victims were admitted. Squizzy charged and acquitted. Oct 20 1927 Bridget Cutmore was treated and interviewed. 403 George Street. Home of Arthur trotter murdered by Squizzy Taylor in a robbery in 1913 by Bush Thompson. 31 Fleet Street. Squizy seen running from house after 3 people shot in the Fitzroy Vendetta, 1919. Corrs Lane. Gaurdian office of the Community office (Berlin Bar) where Frank Hardy type-set Power and Glory depicting Squizzy Talor as Snoopy Tanner who committed the murder of a constable at Trades Hall. Gertrude and Brunswick Street, Fitzroy. ‘The Narrows’ centre of Fitzroy Gang, today Housing Commission. Squizzy’ was a colourful figure in the drinking and gambling clubs of Fitzroy, Richmond and Carlton. A dapper little man who dressed loudly=”http://melbournewalkss, race-courses and theatres. While hiding from the police, he wrote letters and verse to the press. Yet he had few redeeming qualities. Taylor won lasting notoriety by imitating the style of American bootleggers; he never matched their influence or immunity from the law, and at the time of his death made the mistake of cutting into the cocaine trade without commanding sufficient fear or loyalty from the underworld Convicted eighteen times mainly for minor offences, his efficient and lucrative business in jury rigging was used with great effect. Known as ‘The Turk’ for his hiding in dugouts, his harem and his strategy (Kemal Ataturk was regarded as a military mastermind). Squizzy resulted from one drooping eyelid making him ‘squint’. Squizzy lived in era of depression, war and the rise of the moral majority. The era saw the rise of profitable illegal industries such as race-fixing, illegal gambling, sly grog and cocaine and prostitution. Bourke street east was a flourishing red light district a recruitment area for his gang of Bourke Street Rats and a network of informers to provide blackmail and theft opportunities. Terror was essential for jury fixing, stand over and blackmail. Lived at a flat in Alma Road with Ira Pender. Lived with Ira and Angas Murray and Richard Bentley who murdered Berriman in 1923 where 12 police in 3 cars raided 443 Barkly Street. On the night of the murder 1927 responded to Snowy Cutmore abusing girls at his sly grog shop in Tennyson Street. Born on 29 June 1888 at Brighton, Victoria, son of Benjamin Isaiah Taylor, coachmaker, and his wife Rosina, née Jones, both Victorian born. The family moved to Richmond as a result of the 1893 depression and Leslie tried to make a career as a jockey on the inner city pony circuit where he came to the notice of the police. Corruption in racing gave Sqiz the taste. Pint sized at 5’2”, he became a jockey apprentice and it was while mingling with the shady characters of the pony circuit realized the easy money to be made in crime. At 18 he was convicted of assault. Other convictions followed, mainly on minor charges of theft. The longest he spent in jail was two years’ imprisonment for pickpocketing a watch at Burrumbeet racecourse near Ballarat in January 1908. Leader of the ‘Bourke Street Rats’ – a rough mob of brawling thieving hooligans who abetted Taylor in his audacious deeds of extortion; a popular plan was to use female decoys to lure a married man of money into a private room, and when in a compromising position, one of Taylor’s lieutenants acting as the ‘husband’ would burst in threatening repercussions unless a tidy payment of silence was made. 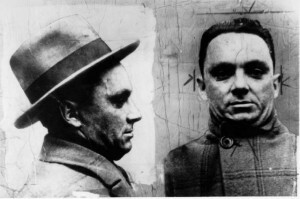 Taylor was linked to several more violent crimes including the murder and robbery of Arthur Trotter, a commercial traveller and the burglary of the Melbourne Trades Hall, in which a police constable was killed. He was probably innocent of this latter crime. After all he was accused of rigging the Grand final at the MCG several years after his death! In spite of the sensational claim in “Power Without Glory” (1950), Taylor was not apparently involved in the burglary of the Melbourne Trades Hall in which Constable David McGrath was killed. Although rarely convicted after 1917, Taylor remained a key figure in an increasingly violent and wealthy underworld. His income came from armed robbery, prostitution, the sale of illegal liquor and drugs, as well as from race-fixing and protection rackets. With Paddy Boardman, he conducted an efficient and lucrative business in rigging juries, a service of which he made regular use. Squiz ‘shelved’ associates in the split of proceeds, upsetting the Fitzroy faction and thus beginning what became known as the 1919 Fitzroy vendettas. The real ‘war’ began one winter’s night when Taylor’s ‘moll’ Dolly Grey was sent to a sly-grog place at 27 Webb Street to test the feeling of the Fitzroy faction only to have her jewels whisked away and left semi-naked; within three weeks some eighteen bullets had been extracted from men who could think of no motive. Taylor had married Irene Lorna Kelly at the manse of St James’s Congregational Church, Fitzroy, on 19 May 1920. He stashed her in Albert Park at his brother’s home to keep his former girlfriend off the track but she located her and dragged her to see Squizzy. The artful dodger provided the public with first-class entertainment when he absconded bail after being caught red-handed for breaking into a warehouse on 16 June 1921. For the next fourteen months he eluded the entire detective force taunting them with letters to the press (“…I have not quite fixed up my private business yet, but as soon as I have I will pop to the C.I.D, knowing that I will be quite welcome…” and “…I trust that others who are wanted by the police will follow suit and join in the “Back-to-Pentridge” celebration, which they will find under better conditions than of old…”). Reputedly hid at 66 Glenhuntly Road, Elwood. Gave himself up in September 1922. He was acquitted after two trials. It was while awaiting a decision of the courts he attended a race meeting at Caulfield but was ordered off resulting in the mysterious burning of the administrative offices on the night before the Caulfield Cup. On 8 October bank-manager Thomas Berriman was robbed and murdered in underpass at Glenferrie railway station. Angus Murray and Richard Buckley were charged with the murder. Taylor faced charges of aiding and abetting the crime, and of assisting Murray’s escape from Pentridge prison. On both counts he again escaped conviction. 12 police cars raided 443 Barkly Street St Kilda where Ira Pender, Taylor, escapee Angas Murray and Richard Bentley were holed up. He was eventually found guilty of harbouring Murray and sentenced to six months imprisonment. 7 January 1913; Taylor was at first charged with being an accessory along with Angas Murray and Richard Buckley but won a nolle prosequi. Subsequently tried twice to break Murray out of gaol. Murray was eventually hung. In 1923 they had Muriel Pender co-starred in a film about Taylor’s life, Riding to Win; banned by the Victorian censor, it was released in Brisbane in 1925 as Bound to Win. On the eve of the 1935 Football Grand Final, Bob Pratt (the champion full forward of South Melbourne Football Club) was getting off a tram when he was hit by a brick truck. He blamed “the Collingwood Gangster” (ie Squizzy Taylor) for arranging the accident. Squizzy’s greatest achievement considering he’d been dead for seven years. On his release from prison Taylor continued thieving, but concentrated his efforts on race-tracks. Involved in selling cocaine, he came into conflict with several Sydney gangsters. He was wounded in a gunfight with one of them, John ‘Snowy’ Cutmore, at a house in Barkly Street, Carlton, and died in St Vincent’s Hospital, Fitzroy, on 27 October 1927. Survived by his wife and by a daughter of his first marriage. Taylor was buried with Anglican rites in Brighton cemetery. The circumstances of the shooting have become shrouded in mystery even though the coroner settled the matter by finding a simple fatal gun duel between two opposing criminals. This was in spite of the Eibar “Destroyer” .32 calibre used to shoot Squiz being found under the picket fence of a house in McArthur Square some 200 paces from the house while the Melbourne Truth contended that three more bullets than what could have been discharged by the revolvers of Cutmore and Taylor were fired. Were Squiz and Cutmore knocked off in one go?